The following link is a graph I put together that has come out of a much deeper analysis of Warzone's 1v1 Ladder and how it rates/ranks players. 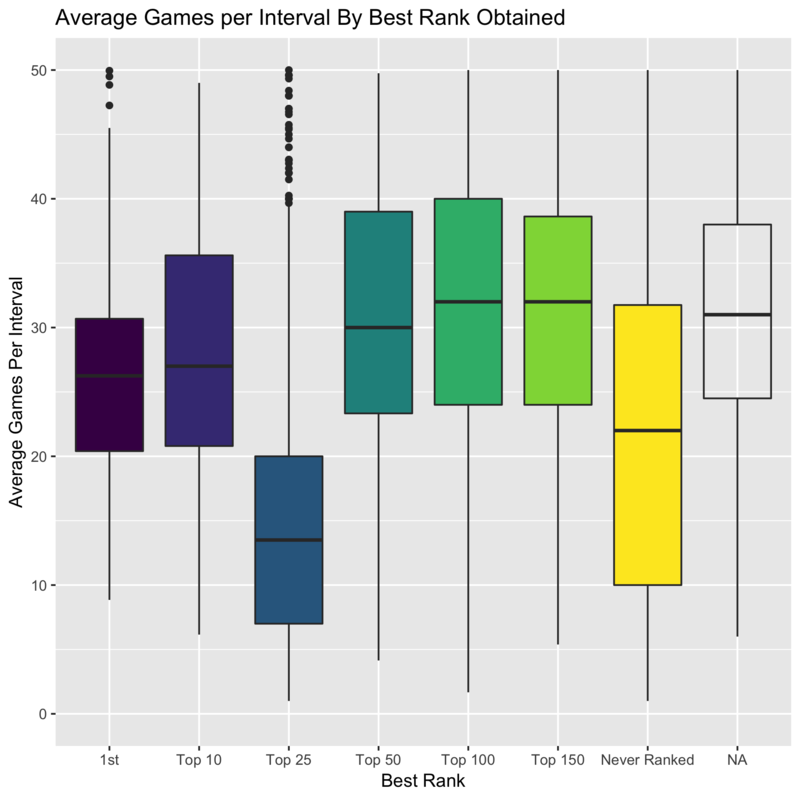 The graph shows the average number of "games per interval" by the best rank obtained by players (a player in bucket "top 25" would be a player whose best rank ever achieved is between 11 and 25 inclusive). Games per interval is a measure of how many games a player played before taking time off from (leaving) the ladder. Hence, average games per interval is representative to a large degree of players' attempts to put together separate "ladder runs" that allow for players ratings to not be effected by their previous games, often allowing them to obtain higher ranks as opposed to long continuous runs. One key takeaway to highlight from this graph is that a lot of the attempts to game the Warzone ladder rating system (and its very generously short expiration window) are concentrated among players whose best rank ever obtained is in the top 25 (but worse than 10th). Those players average 14 games per interval. The next lowest group (excluding players never ranked) averages 26 games per interval. I find it important in my data rating to distinguish between facts and opinions/hypotheses which have not yet been confirmed. Everything I have presented prior to this sentence is fact, the data confirms it, what follows is simply a hypothesis. I think there are two important conclusions/suggestions that might be drawn from the wildly low average games per interval of players whose best rank ever achieved is 11-25. The first is that when personally evaluating the skill of players, we should devalue players whose best rank obtained is 11-25, they are more likely to have gamed the system to get there (although in no way is this true of all, or even most of these players, it is simply more prevalent amongst them than the rest). The second is that one way Warzone might consider combatting people cheating its rating system changing what statistics it displays on player profiles. Instead displaying players lifetime average ratings/ranks would kill incentive to try to make these types of runs given each individual run is just as likely to end in catastrophic failure as meteoric success, removing the incentive to attempt these types of runs. On a final and slightly unrelated note, This graph and analysis is a very small piece of a much larger set of research I have been conducting on how Warzone's 1v1 ladder rates players. I will in the semi-near future be posting a series of blog posts detailing more of my findings. However, if there are any specific questions you would like me to explore feel free to suggest them and I will consider taking them on. Hmm, not sure about this. The first thing I thought when I saw the graph, is that a failed/short run tends to end in rank 11-25. Basically, to get a rank of 11-25 you don't even need 20+ games. I don't think this means that they are more or less likely to have gamed the system then other categories. It's the trophy that matters for most. You can hide ladder stats on profile already anyway so I don't think this change will have an impact tbh. A more popular suggestion is to change the rating system to something else, like Glicko 2. I am looking forward to those blog posts! While my conclusion is certainly up for debate, I think you might be misinterpreting the graph a bit with your interpretation. The average games per interval is calculated by player. Essentially, the average number of games per run by players whose best rank ever obtained is in the given bucket. It is in fact usually not possible to receive a rank at all in a run (interval) of only 14 games, so this is likely an indicator that players whose best rank ever obtained is in the top 25 are bailing on runs before receiving a rank far more frequently than others (in many cases possibly because the run was not going to result in a good rating/rank. player A has recorded runs of 10, 20, and 30 games, his best rank ever obtained was 43.
player B has recorded runs of 18, 29, and 40 games, his best rank ever obtained was 9.
player C has recorded runs of 22, 31, and 30 games, his best rank ever obtained was 18.
player D has recorded runs of 20, 40, and 45 games, his best rank ever obtained was 12. Oh I see. I did miss the by player part. Well, they still have a rank/rating per say. It's just that warzone hides them from the leaderbord/ official rank :P Either way I understand what you have done to create that graph now. Hmm-time. I am curious to see how it looks if you zoomed in on top 25, with a box-plot for every rank. Hopefully you did this in a way where that is easy to do. Thank you for the graph and your interpretation. I'm definetely hyped and looking forward to read more ladder analysis. However, I have another point to think about. I realized that there are different Warzone personalities. Players who rank about rank 50+ (rating <1800) are more interested in just playing the game instead of winning. They don't care too much, they don't calculate properly, but they enjoy the strategic gaming anyways, because beating up some noobs in Quickmatches or AI's in single-player can be kinda boring. Players who play better, let's say >1950 rating, care a bit more about actually winning the game. They get burnt-out much faster from thining minutes and hours about every turn, so when they lose 2 or 3 games in a row, they might leave the ladder - ragequit-like. They probably never had the intention of gaming the ladder, but still they finish their run with just 10 games played. Another point: The strenght of a player changes over time. For example, I probably had many many "runs" in my warlife, many of them didn't end in the top 10, but for your analysis, you see me as a top 10 player. Question: How do you measure when a run ends? No finished game for, let's say, 4 weeks? Very nice analysis Nick, thank you for sharing. I must admit, I have always had a softspot in my heart for boxplots. They get burnt-out much faster from thining minutes and hours about every turn, so when they lose 2 or 3 games in a row, they might leave the ladder - ragequit-like. They probably never had the intention of gaming the ladder, but still they finish their run with just 10 games played. I preface this with noting my top 1v1 rank is 50. I get the impression that there is a significant number of players (not necessarily a large group) who hop on ladders, take a run at the trophy, and then drop off the ladder either after getting the trophy, or after being discouraged from continuing to pursue the trophy. I am quite sure this is true. Having said that, consider the psychology of these players, and, in particular, how quickly they leave the ladder. If a player quickly enters the top 10, that player likely will pursue the trophy for a while, likely playing quite a few games until they either attain the trophy or are truly discouraged.. However if that player peaks out at, say 20, and then starts struggling to win consistently or to move up in ranking, a ragequit becomes much more likely. With this psychology at play, one can easily see how a player who hits a ranking wall at 20 in much more likely to quit than a player who hits the same wall at 5. With that, these players likely play far less games in their "run" than other players. Is a "run" considered to be average unexpired games, or the number of games played before leaving the ladder (including expired games)?
" If a player quickly enters the top 10, that player likely will pursue the trophy for a while, likely playing quite a few games until they either attain the trophy or are truly discouraged.. However if that player peaks out at, say 20, and then starts struggling to win consistently or to move up in ranking, a ragequit becomes much more likely. " I disagree with this sentiment. It's the people who hit rank 1-10 who I'd consider more prone to ragequit. The 1v1 ladder penalizes losses far more than it rewards wins. The vast majority of people that get rank 1 debut at rank 1. I'm very capable of getting in the top 10, but if my goal were to join and get rank 1 I'd quit after 1 loss unless it was vs. someone over 1900. Even at 19-1 start you only get rated around 2200 typically. Climbing from 2200 to 2400 to take rank 1 is exceptionally hard once you have losses. As an example, Rufus is rated 2387. That's a high rating, sure, but if he was 35-0 instead of 33-2 he'd be at 2553. That's a big difference. The first couple losses someone gets tanks their rating hard from what it was when undefeated, and to raise it back to that previous level requires an insane amount of wins against highly rated opponents. This is why if I were to join the ladder today and aim for rank 1 I'd quit at 20 games if I debuted at 2200-2300. If I debuted under 2300 my only chance to hit rank 1 would be to wait for Rufus to leave, to beat him head to head, or to wait for him to lose more games. Final conclusions aside. Great job Nick, I love the information! Thank you for responding to my comment. I wasn't aware of the interactions between W-L and rating at the top of the ladder, so I appreciate what you have added. Let me expand a little further given what you said. As an example, Rufus is rated 2387. That's a high rating, sure, but if he was 35-0 instead of 33-2 he'd be at 2553. Alright, now keying of your view that if you were pursuing the trophy and you lost to a sub-1900 player, that you would likely leave the ladder, what is the likelihood of you losing to a sub 1900 player? On the other hand if a player debuts ranked 20th to 25th, their likelihood of losing to a sub-1900 player is quite high (assuming of course their debut ranking and rating is representative of their true skill level). In their next 10 games, they are quite likely to lose several games. These players, per the original assumption, got on the ladder in hopes of reaching number 1, or at least top 5, but by their 10th or 20th game, they will realize that they likely can not break into the top 10. Then they leave the ladder. Is this ragequitting? Maybe discouraged is a better word? On the other hand, your point is quite valid that a more talented player who could reach top 5 might by error or bad luck drop a game to a lower ranked player quite early. In that case, as you described, the talented player might just quit given how difficult it will be to reach number 1. In Warzone, it is always possible to lose to a <1900 player. That is because this game involves a little bit of randomness and luck, whereas in chess for example Magnus Carlsen would never lose a single match against a <2300. And that's alright. The problem is, that Warzone players get punished as hard for this loss as Carlsen would get punished. Note that plenty of failed ladder runs don't ever finish enough games to get a rating, so that can skew the results a bit. While it would have been great to be able to calculate runs by measuring when players left and rejoined the ladder this was unfortunately not possible given the available data. Instead, for each player, their average number of games per interval ("run")was calculated in the following manner. Players receive a rating when they have at least one unexpired game. So by simply looking to see when a player's rating is unavailable you can see when they have let all of their previous games expire, and we call this a run. It is by no means a perfect method but it is pretty accurate, and certainly accurate enough to give a good picture. "Alright, now keying of your view that if you were pursuing the trophy and you lost to a sub-1900 player, that you would likely leave the ladder, what is the likelihood of you losing to a sub 1900 player?" I started 19-1 in 2017, with my only loss being a brawl game where I made a very minor error vs a player rated in the 1700's. That particular player I'd anticipate beating over 90%, but it was a very brawly map where there was a very obvious set of "best picks" that resulted in he and I making the exact same picks in the exact same order which hugely reduced the margin of error allowed in the game. At 19-1 I got close to 2200, after winning 3 more games to be 22-1 I reached 2214, if I had been 23-0 instead however I'd have hit 2420, that one loss is the singular reason I don't have the 1v1 ladder trophy. I think there's actually a lot of people that lose more to low rated opponents as well due to them being harder to predict at times. I think it's disingenuous to some degree to blame opponents for ones defeats, but there is some truth to it that it is harder to predict people who don't play the game at the same level you do. It was my 8th highest rated opponent that delivered me my first loss. Bigchps is good enough to beat anyone, all three of his notable wins are vs malakkan for example, so I'm far from the only player he pulls upset wins against, but historically I have beat him far more often than I have lost to him. That's 14-0 vs people rated over 2000, with 2 losses to sub 2000's. Alright, speculation aside I am going to mathematically give everyone the answer to the question about losing to sub 1900 players based on Warzone's current rating system. For anyone who doesn't know, Elo rating system's have a few nice formulas involved with them one of them predicts the win probabilities of 2 players facing each other. Keep in mind that since this rating system is not perfect neither are the predictions, but this should give you a decent idea. So, while it is highly unlikely in theory that a 2200 rated player loses to a 1700 rated (about 5% chance), it is far from unfathomable. @Nick: Are you able to make a graph which shows the actual outcome compared to the expected outcome related to the formula you used before? My prediction is, that for the example 2200 vs 1700 the actual score is not 5% (as predicted) but something like 10%. Same for other cases then. 1) ELO assumes a logistic distribution of skill, which may or may not be the case on Warlight. 2) Warlight uses Bayesian ELO, which can highly overestimate ratings with a low sample of games. My highest rating is 2340; i definitely do not have a winrate of 94.68% against 1800-rated players. So when you try to compare a player with a rating of x and another player with a rating of y, you have to make sure they're at least in a certain confidence interval of actually having that rating. Which is something that Bayesian ELO fails to do a lot. Other than that, really interesting data! farah was so excited about his contribution that he had to send it twice! 5% seems also pretty low to me, but then again also kina legit. You win 19 games and lose 1. I'm not sure what statistical effect this has, but maybe the 2200 guy only got to his 2200 rating because the ladder protected him from losing to 1700 ELO guys due to him getting paired up against players in his range. I'm thinking about something like that it might be easier for the 2200 ELO guy to beat up 2000 ELO guys 75% of times than beating up 1700 ELO guys 95% of times. I'm thinking about something like that it might be easier for the 2200 ELO guy to beat up 2000 ELO guys 75% of times than beating up 1700 ELO guys 95% of times. In chess I would disagree, regarding warlight this really is an issue. I could not agree with you (and several of the following comments from Malik, Norman, AI) more, Farah! In fact, one of the projects i'm working on now is based off of this exact claim (about how ELO is in some ways not a great fit for warzone, and what could easily be done within the confines of Bayesian ELO to at least improve its accuracy). This doesn't detract from your overall point, but using your highest rating as a reference point seems misleading. More accurate would be your average rating over the interval in question. In this case, it's indeed misleading, but that's a flaw of Bayesian ELO. Your rating over a certain interval is supposed to be dynamic. Your skill gets better or worse over time, so fluctuates in an interval. Your peak rating is supposed to be your peak performance, e.g. you have performed at that level of play, according to the rating system. So what my peak rating is supposed to say is that at a certain time, i performed at that level. Which is not true, obviously. I can't speak for other players, but I don't take off time to let my games clear and then make a run. usually, I join a ladder when my game count is lower and I need something else to do. I am rarely on more than 1 ladder at a time. If I were trying to manipulate the ladder, I would join before my games all expire, to take advantage of a period of wins (right after some losses expire). Right now I am doing 2v2 ladder with two accounts. I have no goal of making #1, it won't happen as when I play solo I tend to commit right away and don't put the needed effort into it. I just wanted to get some more experience on it and nobody in my clan was available to do it (note if someone good wants to play it with me, send me a msg on here). I would not consider that a run, as I'm not aiming for top spot. Just upping my game count temporarily which I will end very soon with CL starting up. Elo winrate calculations are never very accurate. In some games the underdog is massively underrated, in others the reverse is true. I might be able to beat a 1700 player close to 95% of the time at strat 1v1, but probably closer to 90%. In chess on the other hand, a 2200 elo player would almost never lose to a 1700. They'd never even play vs each other in tournament play. And no, by almost never I don't mean they'd win 95%, I mean they'd likely win 99.95%. In Warzone meanwhile, I probably couldn't even beat a 1000 elo player 99.95% of the time. 1000 elo players are terrible, I'm not going to beat around the bush and try to not offend people at that rating - they're bad, and they lack fundamental understanding of how to play the game. Despite that, they have been known to very rarely have upsets vs top players where they won by doing things that were super unpredictable and worked as a result. Hm, well in case you don't know elo is also very inaccurate when predicting win rates in chess. Your statement is very inaccurate in this regard, thru I don't have the actual % here. Also 1700 frequently play 2200 in tournaments. Typical example here is kids, but older 1700 players can do this as well. Basically, if you are interested in chess ratings there is a fair amount of articles on the subject out there. The main arguments in favor of ELO, is that it is easy and practical to work with.